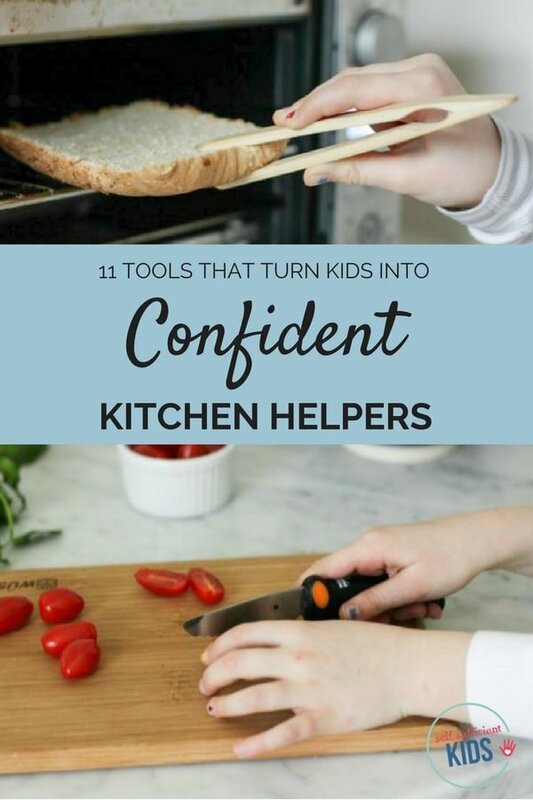 These eleven kitchen tools for kids – made specifically with children in mind – will build your child’s cooking confidence and independence. It’s difficult to remember what life was like before parenthood. I have a vague memory of being able to wake up on my own, stumble downstairs, pour myself a bowl of cereal, and read through the news as I enjoyed my breakfast in – get this – silence. Little did I know how much my life and eating habits would change once I had kids. Shortly after giving birth to my second daughter our mornings grew hectic: changing diapers, nursing, making rice cereal, cutting fruit into tiny pieces, filling a sippy cup with milk, and oh yeah, trying to grab a little breakfast for myself before we’d all go upstairs to get dressed. But as my daughters grew and became more capable, my husband and I had them take over more of their own breakfast and lunch preparation. One of the first steps to raising confident kitchen helpers is to make sure kids have access to everything they need: countertops are accessible for their use, dishes and food are where kids can reach them, and gadgets are easy-to-use and built for little hands. 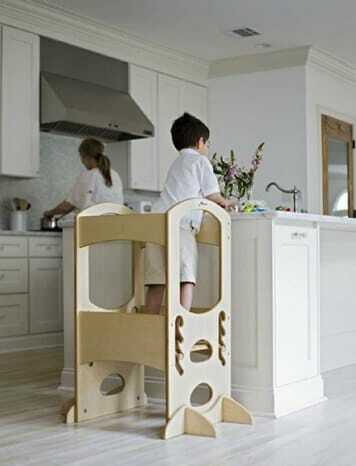 Having the right tools in place can help, such as this Little Partners Learning Tower that lets kids be apart of the cooking process and is adjustable based on height. This tower is also great for letting kids do art projects or other activities where a kitchen counter is the best surface. 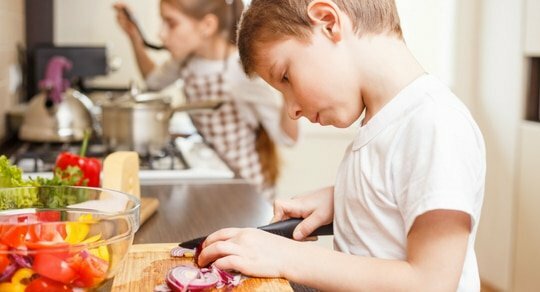 So much of kitchen prep involves knives but young kids aren’t ready to use the sharp kind. This Kuhn Rikon Dog Knife with a serrated edge is not only cute but also builds kids confidence in chopping while still being safe. The Curious Chef 3 Piece Nylon Knife Set is also a good chopping option with different size knives for different tasks. 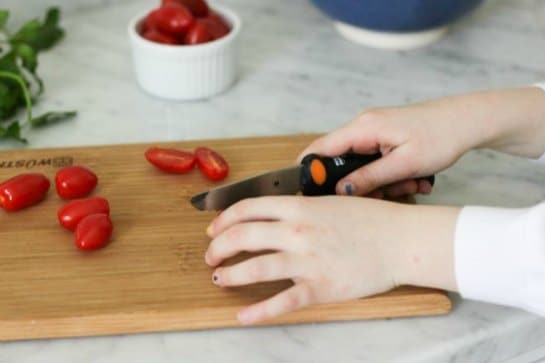 And when children begin using sharp knives, this Opinel Childs Knife Finger Guard can help keep fingers out of the way. One of the biggest issues for kids during breakfast time, in particular, is being able to pour from a huge milk gallon or juice container. 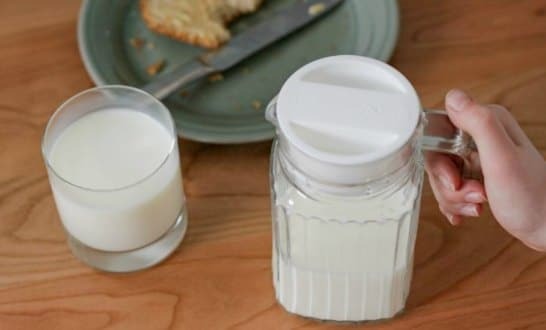 This Luminarc pitcher solves that problem with its small size that is perfect for kids. Little hands can wrap their fingers around the handle and easily pour into cereal bowls or glasses. The toaster can be a tricky situation for kids with the hot metal potentially burning their hands. 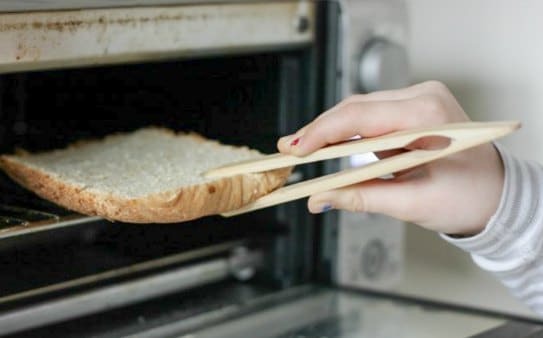 These bamboo toaster tongs let kids safely take bread out of the toaster oven once it’s done. Other hot items can be held with these kids mitts set that are just the right size for small hands. Having the right tools can help kids feel more confident, not to mention that it’s fun to have one’s own tools. Fuzzy Frog Children’s Pastry Baking Set: food-grade silicone baking pan mold; butterfly, heart, and scallop cake mold; a spatula and pastry brush. I’m grateful my girls have become confident kitchen helpers – but I’m not going to stop there. Ultimately, I’d like my kids to learn how to cook – just a few basic skills at a minimum – so they’re able to prepare meals at home as adults. Research shows that people who frequently cook meals at home eat healthier and consume fewer calories than those who cook less. So teaching kids how to cook often means setting them up for a healthier diet in the future. Plus, home cooked meals are often less expensive than prepared foods. So adults who know how to cook also have the ability to keep their food budgets in check. But where to begin? And how to know if you’ve covered all the basics? 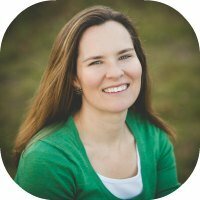 Just recently my girls began taking online classes through Kids Cook Real Food. I shopped around for other cooking classes and this one stood out as the best. Courses are clustered around age ranges and abilities and cover everything from how to crack an egg, to independently following a recipe, to learning the safe way to use knives.